In this study, laminated composite materials were hybridized with E-glass fiber and Nitinol (Nickel-Titanium) wires. Hand lay-up technique was used to prepare the samples, epoxy resin type (Sikadur 52 N) was used as matrix reinforced by one fiber from E-glass fiber woven roving with embedded nitinol wires with a diameter 0.5 mm for samples and number of wires such as 0, 1, 3, 5 and 9 to find the effect of the number of wires on the natural frequency. The samples were fixed as a cantilever beam. The effects of increasing the number of nitinol wires, the diameter of nitinol wires, the length of the cantilever beam and the thickness of beam on the natural frequencies of the beam were studied. Also, the effects of the tapered in width side and thickness side on the natural frequencies of cantilever beam were studied. The results showed that the increasing in the number of nitinol wires and the diameter of nitinol wires lead to decrease the natural frequency in martensite phase and increase the natural frequency in austenite phase. Also, the increasing in thickness of beam and width ratio of the beam lead to increase the natural frequency. As well as, the increasing in the thickness ratio leads to increase the first natural frequency and decrease the second and third ones. In addition, the increasing in the length of the beam decreases the natural frequency. 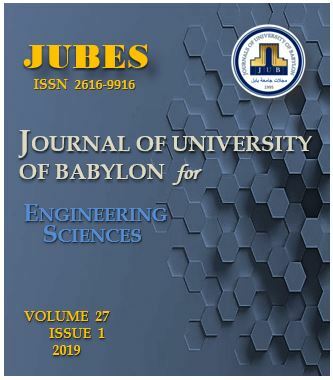 Q. Atiyah, A. Hameed, and B. Assi, “Vibration Analysis of Uniform and Tapered Composite Beams with Embedded Shape Memory Alloy”, JUBES, vol. 27, no. 1, pp. 82 - 93, Jan. 2019.